Genesis 14:18-20 depicts an interesting encounter between a mysterious, unknown figure and Abram. Scripture does not elaborate on the identity of the King of Salem. However, King David makes mention of him some 900 years later, in the Book of Psalms. "The Lord has sworn and will not change His mind: You are a priest forever, in the order of Melchizedek." Over one thousand years later, Hebrews lists several passages concerning this mysterious figure. Four verses later a most remarkable comparison is made. Jesus is said to "have been called out by God as a High Priest according to the order of Melchizedek." (Heb. 5:10). Jesus, the Son of God, is said to be a High Priest, not unto an order of Himself, but unto the order of this mysterious Priest/King! A chapter later the same information is deemed so important as to be reiterated once again. This time, the name Jesus is specifically mentioned. The association with Jesus cannot be denied. Thus the question naturally arises; Just who was this mysterious figure? Was he an Old Testament manifestation of Jesus Christ Himself? Was he one of the Antediluvian Patriarchs, allowed to live a very long life in order to help establish God's chosen nation? Was he simply a righteous king, misinterpreted through the ages, a victim of translation? As is the usual case, many theories abound, some creative and fantastic, some remarkably persuasive. Even Abraham, one of the mightiest men in the Bible, subjected himself to the Priest of the Most High God. The Levitical tribe of Israel is the priestly tribe, the tribe entrusted with the carrying out of God's will and messages to His people. These were the priests responsible for the ark of the covenant. These were the priests that dwelt in the Temple, and carried out its sacrifices and offerings to God. The High Priest of this tribe was the one whom entered the Holy of Holies once a year to receive God's forgiveness and mercy towards His nation. The tribe of Levi is named after Levi, one of the twelve sons of Jacob by Leah. Abraham and Aaron were sons of Amram, a son of Kohath. Kohath was one of three sons of Levi. It was of this tribe that John the Baptist would descend from as well. When Moses left Egypt, Aaron stayed behind, and gained a reputation for eloquence in speaking. Moses appointed him his spokesperson to Pharaoh, and later Aaron became the first High Priest of Israel. Thus, the priestly tribe was descended from Levi, through Aaron, the brother of Moses. Melchizedek, however, predated this priestly tribe, as stated in Hebrews 7:10. "because when Melchizedek met Abraham, Levi was still in the body of his ancestor." The following verses continue to focus on the comparison between the two separate orders of priests. "11. If perfection could have been attained through the Levitical priesthood, for on the basis of it the law was given to the people, why was there still a need for another priest to come-one in the order of Melchizedek, not in the order of Aaron? 12. For when there is a change of priesthood, there is also a change of the law. 13. He of whom these things are said belonged to a different tribe, and no one from that tribe has ever served at the altar." When read in context with the passage, the "one in the order of" from verse 11, appears to be Jesus. He has come not in the order of Aaron, but to change the law found within the order of Aaron. Thus, Jesus comes in the order of Melchizedek. The "He of whom these things are said" in verse 13, appears to refer to the Priest/King. He certainly belonged to another tribe, yet a tribe where he served as priest of the Most High God, and blessed Abraham, the father of the fledgling nation. Yet, neither the King of Salem, nor any of his descendants, ever served at the altar, as indeed, that became the duties of the Levites. There can be no doubt, however, that he served in an order of priests God had in operation centuries before Moses and Aaron. Verses 15 and 16 talk of the qualifications necessary to be a priest of this order. This priesthood was not based on lineage, handed down from one generation to the next. In fact, this priesthood was not handed down at all, but, rather, appointed by the Most High God, in reward for an "indestructible life". Click Here To Post Your Theories & Questions on Melchizedek. Do you have a theory as to the Priest/King's identity? Give us your insights, thoughts, questions, and comments by clicking on the link above! Melchizedek was declared a priest of God in Heaven by the book of Hebrews. Daniel Oyegun explores this mysterious man in his book The Person Of Melchizedek. His identity has remained a mystery, and Oyegun looks at him in a purely Biblical perspective, and illuminates several fascinating aspects of the person and priest! Click on the link below to visit Barnesandnoble.com. The Dead Sea Scrolls refer to the Priest/King as well, in 11Q13, a fragment found in Cave 11. This scroll dates from the mid-first century B.C. In this fragment, he is pictured as a divine being. The Hebrew title Elohim, and El, is applied to him. Elohim is the ancient Hebrew expression of divinity. It is the third word in the Book of Genesis. In some instances it refers to the single God of Israel, even though the word itself is the plural form of the word El. In other instances, it refers to the polytheistic belief in multiple gods, so prevalent throughout Canaan, and even refers to the Canaanite pantheon itself. The Priest King of Salem is pictured as a heavenly deliverer in The Dead Sea Scrolls. One passage reads; "And Melchizedek will avenge the vengeance of the judgments of God..."
In this passage, he is seen against an eschatological background. It is by his strength he will judge the "holy ones of God". This Priest/King is also said to be the one who will save man against Belial/Satan. "And your Elohim is Melchizedek, who will save them from the had of Belial." It should be noted that Jewish tradition also interprets Elohim as judge in some instances. It is in this respect he is called Elohim, it would seem. He will preside over the final judgment of his demonic foe, Belial. Whatever his identity in the Dead Sea Scrolls, it is clear he is thought highly of, and placed as some sort of judge over Satan. His connection to God is clear through the use of the appellations Elohim and El, and his role as judge. Clearly, this mysterious figure was extremely important to the ancient Hebrews and their faith. The Second Book of Enoch is considered to be part of the Apocalyptic Literature, and is from an unknown Jewish author. Dates range anywhere from the 1st century BC, to the 10th century CE (that is AD). The late 1st century AD is preferred by many scholars. The section pertaining to the mysterious Priest follows the succession of the priestly line stemming from Enoch of the Old Testament. In the "Exaltation of Melchizedek", he is said to have been born of a virgin named Sofonim, the wife of Nir, a brother to Noah. In this account, Sofonim dies in childbirth, and he is born after her death. At the time of his birth, he is fully developed physically, clothed, and speaking, and sits beside the body of his mother. He is said to have been blessing the Lord, and received the badge of priesthood. Forty days later, the archangel Gabriel takes him to the Garden of Eden , to escape the upcoming Deluge . Thus, he is spared from having to board Noah's ark. References from the Gnostic Gospels propose that this is, in fact, Jesus Christ. Many of the lines from this text parallel those from the Bible in their descriptions and references to Christ. In this narrative, he lives, preaches, dies, and is resurrected. "The Coming of the Son of God Melchizedek" speaks of his returning to earth. He is supported by the gods, and is viewed as a priest-king who bestows justice mercifully to his faithful subjects. The Midrash associates him with Shem, Noah's son . Shem predates Moses and Aaron, yet is said to have been a priest. Melchizedek was said to have instructed Abram in the Torah, and handed down the robes of Adam to Abram. He was clearly acting the role of priest in his encounter with Abram. He received Abram's tithe, one-tenth of all Abram possessed. He also blessed Abram, yet he blessed Abram first, before God. The rabbi's hold that perhaps the priestly line was to originally descend from Melchizedek, yet because he first blessed Abram, God brought the priestly line forth from Abram's descendants instead. Nevertheless, this blessing brought much prosperity upon Abram, Isaac, and Jacob. Whatever the interpretation, it is clear that Melchizedek represents some sort of Christ figure in the Old Testament. His name means "King of Righteousness", and he is called "King of Salem", which is another word for "peace". The Biblical history of Jerusalem also begins with this passage, as it is the earliest Biblical reference. He is the first priest mentioned in all of the Bible. He used the name El-Elyon to stress the power and absoluteness of the Most High God, as opposed to the many gods of the Canaanite pantheon. The Priest/King referenced Genesis 1 when he claimed God to be the creator of Heaven and Earth. It is also interesting to note that Abram associated the Priest/King with the same God which called him from his father's household in Haran. This led Abram into the land of Canaan . It would appear, thus, that God had already established a priesthood of some sort in Canaan, in anticipation of Abram's arrival and eventual settlement within. Abram willingly tithed one-tenth of all he had to God's Priest, thus indicating his subjection to God's servant. The bread and wine brought forth by the Priest could indicate one of two possibilities. If the bread and wine was brought as refreshment for Abram and his troops, a very large amount would have been needed, perhaps alluding to the fact that Melchizedek was a man of great wealth and resources. The bread and wine, however, may have been ceremonial only, as a thank-offering to God for the deliverance of Abram. Questions arise, however, with the title "King of Salem". Many scholars claim this "Salem" to be Jerusalem. Thus, "the King of Salem" is King of Jerusalem. However, Jerusalem, in the time of Abraham, was under the influence of the Jebusites. Jebusites were descended from a Canaanite tribe. Jebus, the Jebusite, is later said to have been King of Salem. It is likely, therefore, that the Jebusites practiced the worship of the same Canaanite gods and goddesses condemned continually throughout the Old Testament. Consequently, it is natural to assume that this particular "King of Salem" could not have been a Jebusite. Yet, how would he become King of a city like Salem? 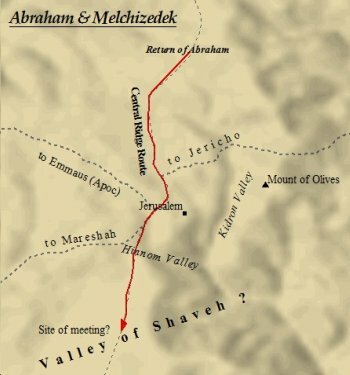 How was it that Abram recognized Melchizedek? After all, Abram had been called to a land he knew nothing of. If Abram recognized the Priest of the Most High God as being superior to himself, why was Melchizedek not picked by God to establish His nation? Melchizedek's priesthood is recognized as being superior to that of Aaron. It is also evident he is superior to Abram. He receives Abram's tithe, and it is he who blesses Abram, thus the one blessing is in fact superior to the one receiving the blessing. The majority of commentators on Genesis and Hebrews consider him to be an ordinary man, used as a type of Christ. This theory does not seem to adequately answer the questions raised about him in scripture, nor does it seem to place enough importance on the man whom Jesus is said to model in priesthood. If the genealogy of Genesis 11 does not possess gaps, then Shem would have lived until thirty five years after Abraham's death, dying at 600 years old. If Shem is indeed Melchizedek, the name is then used as a title, not an actual name. This title would seem to fit the biblical account of the Godliness and righteousness ascribed to Shem. The following scenario is not an unreasonable one. Sometime after the Dispersion of Babel, Shem, under divine guidance, moved to the place where God would one day establish His throne. There he ruled as a peaceful sage, a "King of Righteousness". Thus it is possible he did in fact reign as King for a time in Salem. This does not necessarily have to contradict the biblical account of Jebus, King of Salem, and the Canaanites ousted by King David centuries later. It is quite likely that Shem passed down the patriarchal records to Terah first, then perhaps to Isaac , after Abraham's death. Scholars have used this theory to point to the reason why there are no sections in Genesis named "The generations of Abraham". Genesis 11:10-11:27 has been sectioned "The generations of Terah", because it is written by Terah. Genesis 11:27 - 25:19 carries the title "The generations of Isaac", written by Isaac, the son of Abraham. During the time of this encounter , Terah, Isaac, and Abram were all alive. Terah lived in Haran for 60 years after Abram left for Canaan. Isaac was 35 when Terah died, and 45 when Shem died. These calculations assume no gaps exist in the Genesis record. In this respect, the eternal priesthood of Melchizedek can be viewed as referring to the line of the promised "seed of the woman". This seed was handed down from Adam, through Shem, through Arphaxad (son of Shem), to Abram, through Judah, son of Jacob, and eventually to Jesus Christ, a descendant of the tribe of Judah. Proponents of this theory argue that the order of the Melchizedek priesthood is an eternal order, preserved by those men chosen by God throughout history to represent Him to mankind, and intercede on behalf of mankind to God. Adam, thus, would be the first priest in this order, as he had no mother nor father, nor was he born, but created by God from the dust. Jesus Christ, then, is recognized as the last priest in this order. He does not possess any descendants, neither does He have an end of life. However, questions regarding this theory remain. Adam, did in fact, have a beginning of days. This is in direct contradiction with the description given in Hebrews 7:3, where the Priest/King is said to have no mother or father, no beginning or end of days, no genealogy, yet remaining a priest forever. The context of the passages from scripture also seem to talk of a specific person, not a general "order" of which a certain man was a member. This can be seen in Abram's tithe. The first mention of tithing in the Bible is found in Genesis 14:20. 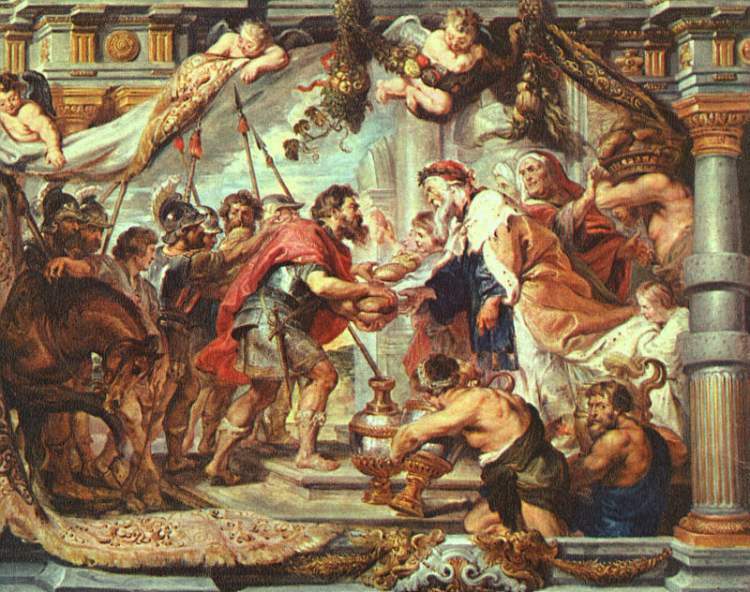 Abram is said to have given Melchizedek "a tenth of everything". Some scholars assume this to mean a tenth of the war spoil, however, this may not be so. Abram is reported to have refused any spoils from an ungodly nation, thus he took none of the spoils (Gen. 14:21-24), giving all to the King of Sodom. Thus, though the Bible does not specifically state this, it is quite possible that Abram did in fact give one-tenth of ALL that he had to the High Priest. Another theory remains which claims this figure was actually Jesus Christ Himself, in one of His pre-incarnate forms. This claim does correspond most readily with the literal interpretations of the scripture concerning the nature and person of the mysterious king of Salem. Hebrews 7:3 undeniably speaks of the person of Jesus Christ. Only Christ can stand up to the literal meaning of this verse. Questions arise in response to this theory as well. Some argue Melchizedek is said to have been made "like unto the Son of God". This was not the same as being made AS the Son of God. Another part of this argument points to Hebrews 7:4. This verse claims he is a man. This could not have been true of Christ pre-incarnate, proponents argue. The question cannot be agreed upon unanimously by scholars and historians. However, the theory most consistent with the literal translation of the Bible, and the theory with the least difficulties, is the one which points to Melchizedek as a pre-personified Jesus Christ. He is a manifestation of God in the flesh, in person, face to face with Abraham. Do you have a theory on the identity of Melchizedek? Questions or Comments? Post here concerning this Priest of the Most High God. Could he be one of those mentioned in Mark 9:1 ? Either he was a pre-personified Christ, or the Adam from another planet (unfallen) who was on a mission for God. "Yes, I would like to know how I could find the age of Melchizedk when he died?" "I would like to know at what age was Melchizedek when he died...?"